These use cases focus on building enterprise social business internal capability, and they are also helpful to consider when selecting social business advisors. Please consider these five as models that you can use to frame your situation and create your individual approach to social business transformation. Each social business strategy use case has a business focus that summarizes how it adds value to the enterprise. The life cycle focus refers to the Social Business Life Cycle (see graphic immediately below). Finally, each has a social business focus. 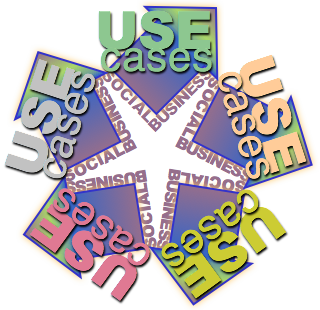 Social business strategy use cases map to different parts of the Social Business Life Cycle. I predict that all enterprises and businesses will eventually complete the life cycle, which describes the process of transforming legacy—i.e. non-digital-social—enterprises into digital social organizations characterized by extensive interactions with stakeholders in transparent digital social venues—and widespread collaboration for innovation. However, enterprises will use different approaches to get there. Fix Fire Drill and Upgrade Social Media are somewhat more reactionary and tactical; they are focused on maturing promotional social media operations into trust-based, high-commitment collaboration with stakeholders. Catch the Leaders is an explicit effort to outperform rivals by superior execution and explicitly plans beyond Pilot. Herd the Cats and Transform the Enterprise add Feasibility to the initiative; it develops a comprehensive view of the enterprise and its stable of brands/businesses, and it looks to transform iteratively. Transform the Enterprise is transformational at the enterprise level as well as at the business/brand level. Here is a longer description of the Social Business Life Cycle. Upgrade Social Media applies to consumer-oriented brands or business to business firms that have been outsourcing much of their social media work to agencies. Consequently, their internal capabilities with interacting with stakeholders in social venues are quite weak. Upgrade Social Media is usually championed by a brand or business unit vice president or Director of Marketing (sometimes CMO), and the goal is to develop more business returns by moving beyond promotional social media interactions. Upgrade Social Media focuses in the Strategy and Pilot parts of the Social Business Life Cycle. Most interactions are outbound and promotional because these firms use social media as another channel for content. Social media has has a growing budget for several years and has a cloud of agencies servicing it. You “serve” customers by asking them to go offline to resolve problems, which broadcasts your lack of confidence. Content and messaging are oriented to products and services, not user experience and outcomes. The brand asks few questions or invites discussions. Social media “operations” are agency-led, and the brand has a relatively small internal team. The metrics used are social media metrics that are focused on brand mentions and other “appearance” numbers; they are not oriented to user outcomes and struggle to show impact on the brand’s profitability. Most brands have had a director of social media for 1-2 years, but they increasingly feel s/he doesn’t have the strategic management skills to build the kind of team to take social business to the next level. Unless the brand/business is very unhappy with their social media results, costs or value proposition, maintain what you are doing while you develop new social business capability. Conduct a social business strategy, which will analyze your ecosystem with new eyes because it focuses on user (i.e. customer/client) outcomes of using your product or service. Very few users want to buy products/services; they buy tools that help them improve their lives in some way. The strategy will also analyze your organization to determine what knowledge or abilities you have, which are relatively easy for you to share, that offer the highest value to users. The strategy will recommend several pilots that average 6-10 weeks each. Usually, the goals are to test the strategy, measure success by changing trust and commitment in relationship; they lead to preference and more revenue. Another key goal is developing competency in interacting with users (“stakeholders”) so their trust in you increases. Pilots are usually staffed by volunteer employees, which is possible because their roles are specific, fun and represent small time commitments. Each pilot concludes with a decision of continuing it (another pilot), rescoping/changing it or killing it. All pilots will teach your team how to interact very efficiently to increase trust, commitment and business. The (social media) fire drill results when an external or internal event explodes and elevates management’s interest in social business/social media. The CMO/CEO/CLO/COO often responds in crisis mode and ends up wasting considerable resources for two reasons: they spend more than they need to and over-correct. Worse, they usually stay away from social technologies because they’ve been burned. They end up with a team that cannot produce maximum social business results because it is reactive and fearful rather than proactive and confident. Fix Fire Drill is grounded in Strategy and Pilot parts of the Social Business Life Cycle; notably, it also emphasizes social business governance, which is tackled in Scale in other use cases. Several parts of the organization have pursued “social media” independently of each other. The CMO wants to elevate it to the “corporate” level, but there’s a nasty power struggle among divisions, departments or brands. The CMO (sometimes the CEO) gets tired of it and wants to bring in an outsider to sort out the mess. A serious lapse in governance has led to significant embarrassment of the firm or brand. A competitor has just won accolades for their social media activities, and the firm has been on the sidelines. The board is asking questions. A new marketing/communications/PR executive has managed a social media effort in his/her most recent role (elsewhere) and wants to push the envelope here. If Fix Fire Drill results from an external threat to the brand, management will want to bring in a crisis public relations firm. They should think twice and ask themselves how much the incident really affects the brand. In many cases, egos are wounded, and shock/anger at the slight are executives’ gut reactions. Inviting a crisis-oriented firm will only strengthen those impressions. One way to think about it is how valuable is the brand’s reputation among key stakeholders anyway? And, what’s the brand’s PR profile, does it have a history of vocal opponents offline/online? If reputation is pretty strong and sustained organized opposition is weak (the case at most brands), sometimes the best reaction is ignoring the incident. The team can save high professional services fees and invest them instead in a team that will handle any future crisis with aplomb. That said, make sure to deal with true “fires” [for examples, see: United, Domino’s, KFC or McDonald’s] before shifting to prevention mode. One alternative to calling a crisis firm right away is to tap connections in your senior team’s professional networks (i.e. executives with social business experience) to get their quick feedback. In the case of a competitor winning attention, calm down and use the Catch the Leaders use case (below); you can plan to power past them by using strategy and out-executing them. As anxious or outraged as some on the team might be, it’s rarely a true fire drill. Internal struggles can be resolved by strategy that shows each team or brand where their true opportunities lie. People usually bicker when they don’t know what else to do or they are unsure of themselves. The strategy will recommend several pilots that average 6-10 weeks each. Usually, the goals are to test the strategy, measure success by changing trust and commitment in relationship; they lead to preference and more revenue. Another key goal is developing competency in interacting with users (“stakeholders”), so their trust in you increases. Pilots are usually staffed by volunteer employees, which is possible because their roles are specific, fun and require small time commitments. Fix Fire drill can also involve some aspects of the Scale part of the Social Business Life Cycle. Pilots have taught your small team reams about how to interact to increase trust; you can often reuse your insights into what makes stakeholders tick to scale new pilots within businesses, enterprise functions or brands. In Catch the Leaders, the enterprise is in a regulated industry or often has a very conservative culture or some other reason for having avoided social media experimentation during the past five years. However, in 2013 many management teams worry about being left behind. Such a firm gravitates to advisors that mitigate risks while leading the firm to overtake the leaders by outperforming them across the life cycle. This is the “tortoise wins the race” use case: by using social business strategy, the firm can outperform rivals by focusing on the quality of interaction, efficiency and focus. Since few firms know how to use social technologies to develop relationships and drive increased business or cut costs, outperforming rivals is usually realistic with a good strategy and consistent execution. Catch the Leaders focuses on Strategy and Pilot parts of the Social Business Life Cycle, and it extends learnings into Scale. The “social media red herring” has wrapped social business in a promotional cloak, and this has put off conservative organizations that squirm in the face of overt promotion. Firm principals’ excuse #1: “we’re a regulated business!” But they can’t explain why pioneers in their industry have won accolades for years. They are often ignorant of pioneers’ social business initiatives. Excuse #2: “our clients aren’t on social media,” but principals flash you the deer-in-headlights when you ask for details of their due diligence behind that conclusion. Clients and patients increasingly ask law/accounting firms and medical offices to communicate using digital social venues, but partners and physicians hang back. The real reason: they’ve never learned how. Young partners and physicians at professional services firms, insurance firms, financial advisory firms and medical offices practice social business privately. You have such a punitive social media policy that professionals ignore it; they contact Marketing for social media advice, but the policy prevents them from helping, so professionals are left to their own devices. Independents push the envelope in these industries because they keep within regulators’ rules but they needn’t contend with over-cautious compliance departments. B2B marketers boast how their staff tweets links to firm seminars, conferences and white papers. But when you ask them about how their social business interactions are changing trust and increasing commitment, they are clueless. By definition, most of these businesses have significant constraints imposed by regulators, cultures and traditions. The exciting thing is, all businesses face very similar conditions, but the biggest limitation is a lack of imagination and ignorance of pioneers that have learned how to push the envelope within constraints. 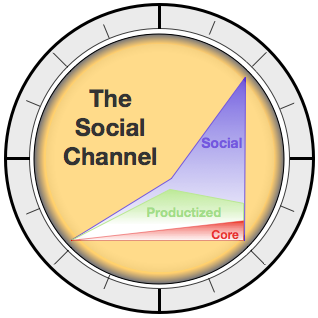 Conduct a social business strategy, which will analyze your ecosystem with new eyes because it focuses on user (i.e. customer/client) outcomes of using your product or service. Very few users want to buy products/services; they buy tools that help them improve their lives in some way. The strategy will also analyze your organization to determine what knowledge or abilities you have, which are relatively easy for you to share, that offer the highest value to users (stakeholders). Each pilot concludes with a decision of continuing it (another pilot), rescoping/changing it or killing it. All pilots will teach your team how to interact very efficiently to increase trust, commitment and business. All help you to refine your strategy. Catch the Leaders outperforms because it’s explicitly designed to use a strategy based on comprehensive due diligence, which it tests and adjusts through rapid iterations (pilots). It aggressively scales pilots that work and powers through the Scale part of the Social Business Life Cycle. Pilots have taught your small team reams about how to interact to increase trust; you can often reuse your insights into what makes stakeholders tick to scale new pilots within businesses, enterprise functions or brands. The enterprise CMO or CDO (Chief Digital Officer) usually champions Herd the Cats when s/he discovers that many business units or brands in the enterprise portfolio have social media presences that have minimal business results to show for their investments. The CMO/CDO has two goals: to use strategy to develop good practices and help inform corporate strategy, addressing issues as diverse as corporate citizenship, community, health or policy. Second, s/he often wants to create a social business “center of excellence” to serve several businesses or brands, leveraging enterprise resources to improve social business performance and business contribution. Herd the Cats requires comprehensive due diligence during Feasibility, strong focus on Strategy, and mentoring in Pilot and Scale parts of the Social Business Life Cycle. The corporation or enterprise has a minimal interactive presence; its typical profile is its agencies tweet press releases about volunteering, annual reports, equal opportunity initiatives, similar content is pushed to its Facebook Page and YouTube channel, and there’s a nominal effort to recruit via LinkedIn. However, none of their presences have trust-based programs that measure changing stakeholder relationships based on interaction. Brands and businesses in the portfolio act in isolation from each other; each has its own agencies, and most have social media directors that focus on coordinating reports from agency activities. None of the brands have specific business cases for social business; their goals are oriented to brand, reputation and public relations goals, not business returns. “Metrics” are grounded in promotion; Facebook likes, Twitter followers, retweets/shares, Pins, etc. Very little specific ties to increased revenue or decreased costs to serve. There are no enterprise standards for social business. Most brands and businesses have their own social media policies. Herd the Cats begins with the enterprise phase in which it uses Feasibility, Strategy and Pilot parts of the Social Business Life Cycle to develop extensive social business competency; pilots enable the corporate center to engage high impact stakeholders meaningfully, often for the first time. In the second phase, the enterprise invites one or two of its brands/businesses to collaborate on maturing their social media; Feasibility has identified brands with the most business potential (based on their stakeholders’ interactions in social venues); for these, the enterprise conducts the Strategy process (social business strategy) for each, and it mentors them through pilots. Notably, the enterprise shows brands how to focus on serving people, not promoting/selling; it guides them through a major mindset change. Both phases naturally seed the enterprise Social Business Competency Team (SBCT). The SBCT produces Social Business Competencies (SBCs, good practices); after collaborating with one or two business/brands, the SBCT codifies its learnings about improving brand performance and scales by approaching other brands in the portfolio. The SBCT reevaluates social media policies and transforms them into empowering social business policies. The SBCT advises the brands in taking back outsourced social media work; it leverages SBCs and mentors brands on realizing business value. Senior management of an enterprise with maturing brands/businesses wants to leverage digital social business to improve performance; its stable is filled with legacy businesses whose growth has stagnated. They hire a CDO to spearhead digital and social business. Senior management is considering a shift in corporate strategy, often involving transactions (merger, acquisition, sale) involving a portfolio brand/business. They want to use social business to pre-validate stakeholder value assumptions (usually in stealth). Often hire a CDO to use digital to either transform businesses, knit them together to create more corporate value, or both. Senior management has decided to go “21st century global” and directly enter geographies/cultures in which it has had no previous presence, so it uses social business to centralize a “center of excellence” for engaging directly with stakeholders to plan, test and scale business digitally. Senior management has decided to spin out a business or brand, and its management wants to go digital/social immediately. Transform the Enterprise is defined by its explicit corporate transformation. Herd the Cats is a more incremental approach to transformation that involved four of the five parts of the Social Business Life Cycle because it approaches social business with the option to stop at any point; transformation is based on the results at several milestones along the way; Transform the Enterprise involves the entire life cycle. Like Herd the Cats, Transform the Enterprise usually includes improving trust and collaboration with corporate stakeholders; however, Transform’s focus is strategic from the corporate perspective. Transform the Enterprise calls for comprehensive due diligence in Feasibility, a strong focus on Strategy, extensive mentoring in Pilot and extended guidance in Scale & Integrate. Unlike any other use case, the CDO organizes and charters the SBCT at the beginning of the initiative and usually hires a vice president or equivalent to run it; they preinvest in the collaboration platform and governance issues like policy(ies) that may need reworking. I rarely recommend looking at policy until Feasibility and Strategy are complete. It can be concurrent with Strategy. Transform the Enterprise often intends to reach Scale and Integrate parts of the Social Business Life Cycle as soon as possible. The variables are deep and wide here, so please consider the following a very loose description. The CEO, CDO or Board of Directors hires an advisory firm to partner with the sponsor, with the consultant taking the lead and mentoring enterprise executives and staff. The consultancy can explicitly mentor the CDO in social business transformation during the engagement. Transform the Enterprise, like Herd the Cats, begins with an enterprise phase in which it uses Feasibility, Strategy and Pilot parts of the Social Business Life Cycle to develop extensive social business competency; pilots enable the corporate SBCT to engage high impact stakeholders meaningfully, often for the first time. The SBCT often mentors and seeds a small corporate social business team as its focus is driving adoption, not ongoing operations. In the second phase, the CDO invites one or two brands/businesses that will be directly affected by shifts in corporate strategy to collaborate on driving strategy with social business; Feasibility has identified brands that are most relevant (based on their stakeholders’ interactions in social venues); for these, the SBCT conducts individual Strategy process (social business strategy), and it mentors them through pilots. Notably, the enterprise shows brands how to focus on serving people, not promoting/selling; it guides them through a major mindset change. Both phases naturally drive development of the corporate Social Business Competency Team (SBCT). The SBCT identifies and organizes Social Business Competencies (SBCs, good practices); while collaborating with one or two business/brands, the SBCT codifies its learnings about improving brand performance and scales by approaching other brands in the portfolio. As a function of corporate strategy, the SBCT leads the scaling of pilots into ongoing programs in Scale. Unlike other use cases, the CDO often wants to pilot and scale initiatives as soon as possible in order to do Integrate, which is focused on replacing legacy business processes with digital, where feasible. The CDO and SBCT are often involved with mentoring brand/business CMOs, vice presidents of marketing or Ecommerce/Digital leaders on transforming their approaches to stakeholders in two steps. First, they reimagine the brand’s role away from a product maker/service provider to an experience enabler focused on stakeholder outcomes, not product/service features. This is “front house transformation.” Second, they coordinate collaboration among stakeholders, users and product development/service delivery to evolve and design new products and services. This is “back house transformation.” See Building Post-Product Relationship in the Social Channel for background and a step-by-step outline. If the brand/business is very large, complex and mature, the enterprise CDO mentors the brand/business CDO. CDOs, CEOs and Boards of Directors can only choose how they will evolve their organizations, not whether they will evolve. Read the Social Channel Executive Summary to appreciate the shifting sands on which your organization stands. Hi Romesh, thanks for your thoughts. I would argue that real “use cases” are grounded in user outcomes that do not assume social business software because everything is a means to the users’ (customer, client..) ends. For example, most of my clients had had mediocre experiences using “social media” approaches to social technologies, which generally assume that promotion and entertainment are what users want. Promotions usually add little value to users, and entertaining them is like empty calories; tastes good for a second but adds little substance. I have found that the most reliable way to users’ hearts is by helping them to accomplish meaningful things, which can also be immensely fun. The point is, based on your stakeholders, what unique knowledge or skills do your firm’s core competencies afford you?.. and how can you use them in service to users in a unique way? If using social business software adds the most unique value, interact around that. I try to approach user outcomes with as few assumptions as possible. What do you think?